Changes in cloud patterns could reveal the final resting place of missing Malaysian flight MH370, according to an Australian scientist. 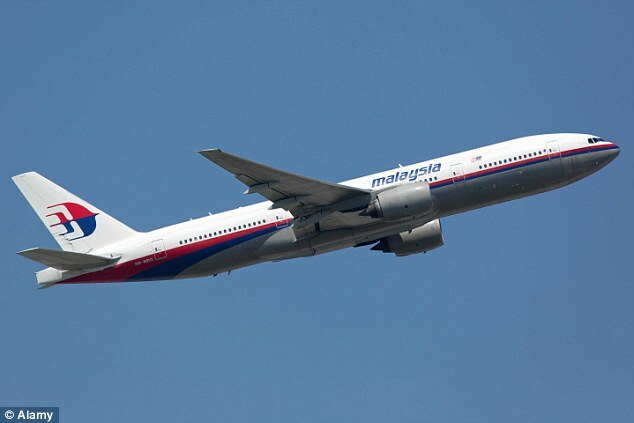 Hydrometeorologist Aron Gingis says that MH370’s path could be revealed by analysing satellite images of clouds, as their patterns are changed by planes’ ‘contrails’ – or condensation trails – interacting with them. In other words, every plane leaves breadcrumbs. 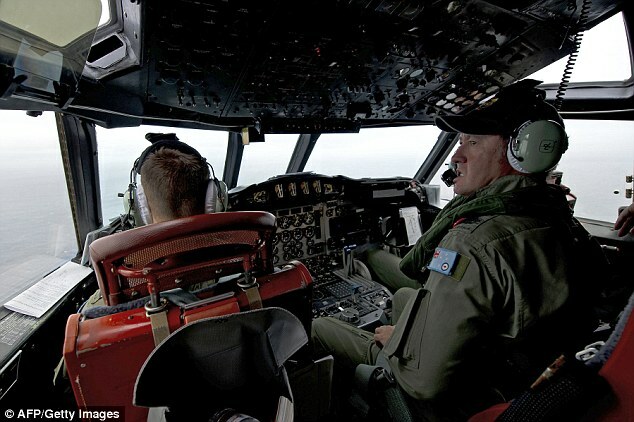 It comes as British satellite company Inmarsat admitted that there is still ‘significant doubt’ over the location of MH370. Mr Gingis, who’s head of the Australian environmental consultancy company Management Consolidated, wrote to the Malaysian High Commissioner Eldeen Husaini at the beginning of April and offered to help with the search effort, according to Au News. He said: ‘I believe that we have a realistic chance to follow the flight path of Malaysia Airlines MH370 and follow its flight direction, possibly identifying its landing or crash site. However, he was told ‘thanks, but no thanks’ by the Malaysian authorities, so instead sent his proposal to the Australian Transport and Safety Bureau (ATSB). They were more interested but the two sides reached an impasse. The ATSB had several questions about Mr Gingis’s techniques that Mr Gingis refused to answer for fear of his commercial interests being compromised. As a result, no trajectories for MH370 have been produced by Mr Gingis. Inmarsat, meanwhile, which has been at the heart of the search for MH370, produced a report recently that left a question mark over whether the plane is even in the ocean. Writing in The Journal of Navigation, it said that while it believes ‘MH370 changed course and travelled in a southerly direction until it ran out of fuel in the southern Indian Ocean, west of Australia’, it stressed that ‘the sensitivity of the reconstructed ﬂight path to frequency errors is such that there remains significant uncertainty in the final location’. The Beijing-bound Boeing 777 lost contact with air traffic controllers after taking off with 239 on board from Kuala Lumpur on March 8. However, it transmitted signals to Inmarsat’s Indian Ocean Region satellite, leading the company’s analysts to conclude that it continued to fly ‘for several hours after loss of contact’. 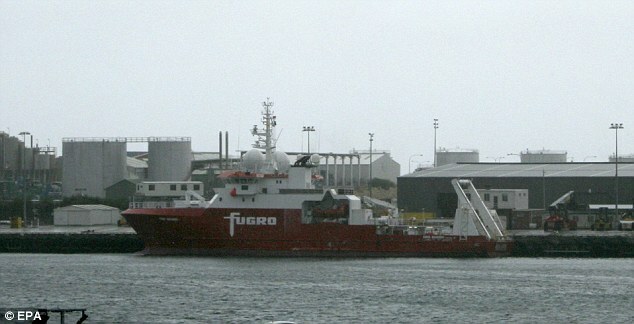 The ship Discovery, provided by Dutch contractor Fugro, was scheduled to arrive in the search zone about 1,800 kilometers (1,100) miles west of Australia on Wednesday, the ATSB said in a statement. The GO Phoenix, a Malaysian ship that has been combing the area since early October, is in the Western Australian city of Fremantle getting fresh supplies. Malaysian Defense Minister Hishammuddin Hussein, who was in Australia to greet the GO Phoenix during its return to port, said everything possible was being done to find the Boeing 777, which inexplicably disappeared on March 8 during a flight from Kuala Lumpur to Beijing with 239 people on board. The search ships are dragging sonar devices called towfish through the water about 100 meters (330 feet) above the seabed to hunt for the wreckage. The towfish, which are also equipped with jet fuel sensors, transmit data in real-time to those on board the vessels. The underwater search resumed in early October after being on hold for four months while crews mapped the seabed in the 60,000-square kilometer (23,000-square mile) search zone. The GO Phoenix has searched over 1,200 square kilometers (460 square miles) so far. Despite a massive air and sea search, not a single piece of debris from the plane has been found. Australian officials are still receiving reports from people who believe they have found wreckage washed up along the Australian coastline, but all have been false alarms. 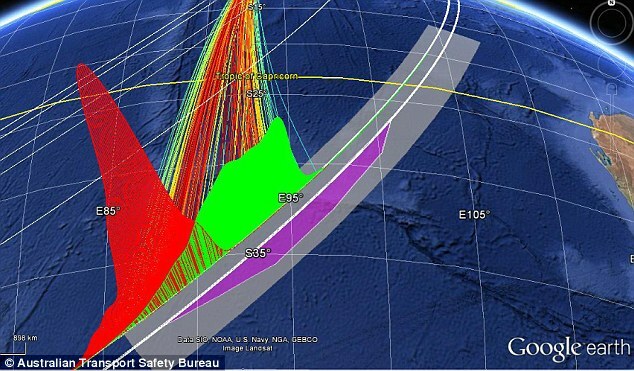 Drift modeling by the Australian Maritime Safety Authority has shown any floating debris would likely have traveled west, away from Australia. Because of that, Australia asked Indonesian officials to be on the lookout for any wreckage, as it is possible some may have drifted to the island nation’s coastline, the transport safety bureau said. Meanwhile, a third ship, the Fugro Equator, is still mapping areas of the search zone and will join the hunt once that is complete. The search is expected to take up to a year. The chief executive of Emirates earlier claimed that ‘control was taken of’ Malaysian Airlines flight MH370 before it vanished. Sir Tim Clark said it was very important that the airline industry does not accept that the fate of MH370 is an ‘unexplained mystery’. His airline, Emirates, operates almost 130 Boeing 777 aircraft, similar to the doomed jet. This entry was posted in Science, Unexplained and tagged cloud patterns, conspiracy, contrails, Malaysia Airlines, MH370, satellite images, search. Bookmark the permalink. ← MH370 – Who benefits most?